I’m an iPhone owner. There’s a heck of a lot I like about the phone – it’s well-designed, looks attractive and has great apps. But there are a few things I don’t like about the device, too. Storage space is neither plentiful nor inexpensive. And, of course, I can never seem to go a full day (or even half of one) without running out of battery power. These problems are common enough complaints that the folks at Mophie designed the award-winning Space Pack case for the iPhone 5 and 5S, an accessory that offers protection, additional data storage and extra juice for your battery. Today, the company has updated that line with a new range of Space Pack accessories for Apple’s newest devices, including the iPhone 6, iPhone 6 Plus and the iPad mini. A standalone battery and storage device called the Mophie Spacestation is also now available for order. The Mophie Space Packs for the iPhone 6, iPhone 6 Plus and iPad mini come in three different storage sizes: 32 GB, 64 GB and 128 GB. 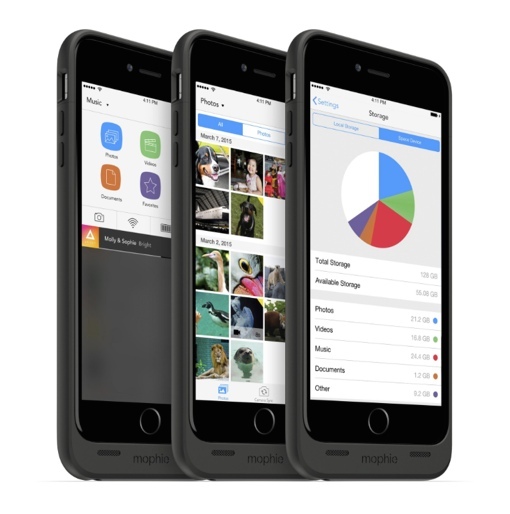 The Mophie Space smartphone app automatically organizes files for you so they’re easy to find when you need them. You can wirelessly transfer files between your phone and computer (Mac, Windows, Chrome OS) using the Wi-Fi Space Portal. If security is paramount, files stored in a Space Pack can be protected with a unique security code. Each Mophie Space Pack comes with a powerful battery built in – the iPhone 6 and iPhone 6 case models have 3,300 mAh of juice; the iPad mini case has 8,000 mAh. This will give the iPhone 6 and iPad mini an extra 100% battery life; the iPhone 6 Plus gets an extra 50%. Like previous models, power can be transferred to your phone with the flip of a switch. And when it comes time to charge your phone and case, the Space Pack is smart enough to let electricity pass through it to charge your phone or tablet first. The battery does add a noticeable amount of heft and a little bit of size to your device, though, so keep that in mind. These high-tech cases are quite impressive and incredibly handy to have, but they are pretty expensive. iPhone Space Packs start at $149.95 (32 GB) and top out at $299.95 for the largest 128 GB model. The iPad mini Space Pack starts at $199.95 (32 GB); the 128 GB model will set you back $399.95, a dollar more than the price of the tablet itself. The stand-alone Space Station ranges from $149.95 (32 GB) to $299.95 (128 GB) and connects to any iPhone or iPad . You won’t find these Mophie cases in stores yet, but you can pre-order them on the Mophie website if you consider them a must-have. The Space Pack for iPhone 6 and iPhone 6 Plus have an estimated ship date of late May 2015; the iPad mini Space Pack ships in two weeks. The Spacestation, meanwhile, is available now and ships in just 3 to 5 business days. For more information, visit mophie.com. It’s true that the iPhone 6 need more battery life and that’s help. But what about the design? And the charging process?